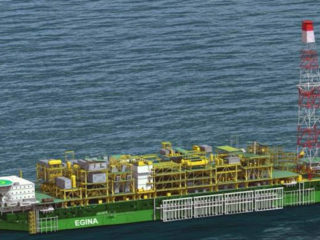 Egina FPSO: What gain for Nigeria? The current strife between Samsung Heavy Industries Nigeria Limited, a South Korean company and Lagos Deep Offshore Logistics Base (LADOL) is a situation government must pay attention to. The first shocking news came to light three weeks ago. It snuck in like a silent mystery. It was about a worrying action by Samsung Heavy Industries Nigeria Limited, SHI. Samsung is not a Nigerian company. It is of South Korea. Its Headquarters is in Seoul. But it is the contractor to Total Upstream Nigeria Limited, TUPNI on the Egina Floating Production Storage Offloading, FPSO, a bonafide Nigerian Project. LADOL is its Local Content partner before contractual friction that put a gulf between them. There is no familiar greeting now. They are in court over various issues. Then the unthinkable happened. Samsung resorted to self-help. It must have concluded that the Nigerian courts were wasting its time. So, on November 27, 2018, Samsung gathered all its muscles, went and barricaded the three entrances to LADOL Ship Yard with extra-thick blocks while the fourth was blocked with a crane. Not done, it erected electric fence around the yard. The fence carried a screaming morbid post – “Danger/1,100V/High Voltage/Gas Area/Explosion Hazard/Keep Off. This furious warning is simply saying that the fence is electrified to kill and only those that treasure death should visit uninvited, needless to adlib that the red-hot warning was targeted at LADOL, in her country. 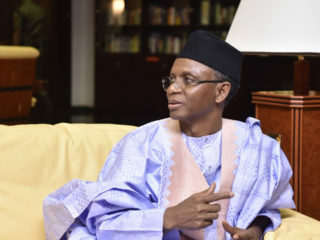 Those who saw firsthand this alarming act described it as the height of impunity and even went further to sniff from it a deliberate attempt to trample the laws of the land and subject the judiciary and the federal government to nauseating mockery. Authorities on oil and gas issues, local content matters, and close observers of this unfolding yet grotesque scenario are wondering whether this could actually happen in any other country, even here in Africa. And their reason is based on the fact that the federal government is a major stakeholder in the FPSO project, the very contract that gave birth to the current hysteria and endless legal clangours. 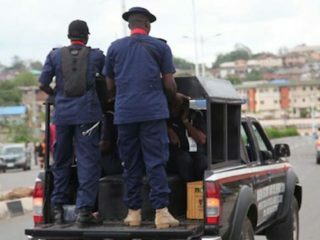 With a 60% equity in all Total ventures in the oil and gas industry, these observers insist that the federal government and its agencies cannot afford to stand aloof or neutral especially as Samsung now seems to act with total disregard for the extant laws of the country and even abusing court processes with endless suits that have been dismissed or thrown out again and again. What rankles even more in this case according to one of the officials of a government agency is that Samsung should ordinarily be quiet as they would have been expelled by some serious countries after the revelation at the public hearing by the Senate Ad hoc Committee, investigating the Local Content elements of the Egina FPSO. It was at this ‘hallowed confines of the Senate’, that it emerged that Total had paid a whopping US$214 million to Samsung for a contract on the upgrade of the fabrication and integration yard at LADOL as stated in the FPSO contract. Samsung was to execute this job as a contractor. But Samsung did not inform its local partner. Samsung, however, did not stop at that, it went further to fix the cost of upgrading the fabrication and integration facility unilaterally at US$300 million and urged its Local Content partner to pay US$240 million representing its 80% equity. After a protracted legal battle, LADOL eventually scarified almost 70% of its shares in an out-of-court settlement. When at the Senate hearing, therefore, it came to light that Samsung had quietly collected US$214 million from Total and kept its mouth sealed, LADOL was justifiably wrathful and promptly returned to court to retrieve its shares it considered dubiously acquired by Samsung. This raging legal tango today, therefore, is for the soul of the fabrication facility, Nigeria’s only semblance of benefit in terms of physical structure from the Egina project. Unfortunately, Samsung has now imported extra-judicial measures into the arena of what had been purely a legal issue. The disconcerting question to ask really is why Samsung Heavy Industries, Nigeria, is still laying claim to this facility of only US$214 million after all that it had been paid over this singular contract and with inconvertible evidence that it acted only as a contractor for the construction of the Yard. How much can Samsung really ask for? That brings in the critical object of this epistle, which has been in issue since April 2018. Questions are indeed being asked in government’s oil and gas related agencies, in local content circles and among oil and experts about this seeming sinuous contract that the cost continues to bulge at the whim gas of Samsung. Yes, the Egina FPSO vessel has since sailed to its destination. But the quest to resolve its cost has become a serpentine journey. The fear now is that if the federal government does not stamp its authority over what has turned out a circuitous negotiation, Nigeria may end up paying about US$5 billion for the Egina project. The initial contract value for the Egina FPSO, for instance, was US$2,993,800,514. This can easily be gleaned from the affidavit deposed to by Young-Yee Lee as part of the Originating Motion filed by Samsung at a Lagos High court on August 6, 2018. This contract price was revised and escalated to US$3,355,941,349. This sum was paid solely to Samsung as the main contractor. But it didn’t end there. What was to follow was a series of variation requests that would stretch the soul of Total, the Nigerian National Petroleum Corporation and other federal government agencies in the oil and gas bloc. The Egina Project Report of June 2017, a Total publication, for example, reveals that Samsung has so far been paid US$546,755,118, as variations. This brings the total contract price to US$3,902,696,467 including the approved variations. But Samsung was not done with Total and Nigeria yet. On April 30, 2018, it issued Notice of Dispute against Total requesting a confounding variation of US$1.6 billion. At the dawn of June 1, 2018, Samsung again wrote the Group General Manager of National Petroleum Investment Management Services, NAPIMS, claiming to be “operating under a financial loss of US$1 billion”, another name for variations. Still, another US$800 million variation is subject-matter of on-going discussions between Samsung and Total and other stakeholders. Succinctly put, then, the Egina FPSO has leapt from its initial contract value of US$2993,800,514 to US$3,902,696,467, including variations. In other words, Samsung has collected additional US$908,895,953 since it hit the Egina jackpot. This actually will translate to 30% of the original contract price. Now, imagine if the US$800 million variation under discussion is approved, it will then bring the increase through variations to a confounding US$1,708,895,953. This will come to about 57% of the original contract sum. No question, this will definitely go down as the highest case of contract variation in the history of Engineering, Procurement and Construction, EPC, contract in Nigeria if not the world. Perhaps, the depressing question Nigeria must find an answer and a healing is this: if Samsung has single-handedly extracted almost US$4 billion from this country with prospects of increase of this amount, (with the US$800 million variations’ negotiations going on), how is it that it cannot allow Nigeria to sip a little benefit from this humongous contract. This is because the facility at Ladol is not just about LADOL. It is about Nigeria. It is about Nigeria’s Local Content; about building Nigeria’s and Nigerians’ capacity and capability, about Technology Transfer, and indeed about creating thousands of jobs for Nigerians. These are at the core of the Nigerian Content Law and the creation of the Nigerian Content Development and Monitoring Board, NCDMB, to see to the consistent and coherent implementation of this law in all relevant contracts. And that is why the NCDMB ensured that Total made the upgrade of the fabrication and integration facilities at LADOL a congenital part of the FPSO contract. This was the exact contention of top management staff of Total. Distraught with all the noise about Egina FPSO and the fabrication yard, he asserts, “There shouldn’t be any controversy whatsoever about the facility at LADOL. These things are well spelt out in the contract documents”. Pointing to a paper, he said, “take a look at this paper, it was extracted from the Egina FPSO contract, (Egina FPSO Contract EGI/C115). From here, you will see that it was Samsung that identified the necessity of building a yard at LADOL. The yard was then included as part of the EPC contract scope. The same Samsung negotiated the cost of the yard”. Turning to another page, he continued, “my brother, look at this one. This is from the initial draft contract. It was Samsung that first quoted US$168 million for the yard. “Here, you can see that the purpose for which the money was budgeted is clearly stated. It was for the yard and nothing else. However, in the final revised contract, the money was increased to US$214 million, because this same Samsung requested for more fund when they found out that the scope of work at the yard was more than they had thought. “So I can tell you categorically that Total paid this money to Samsung as a contractor to build this yard towards fulfilling the local content demands of the contract. I speak to you with full authority, because I know nearly everything that transpired from the beginning to this moment. And that is why no top management staff of Total will support Samsung’s claim to the ownership of the yard or any further variations”, he stated. But a senior staff of the Nigerian National Petroleum Corporation, NNPC, who described the Samsung matter as hypersensitive would contradict the voice from Total, at least, a little bit. Though quite reluctant initially to speak, his few words sketch out authority and insight. “There is still one management staff in Total that argues strongly for Samsung to be paid US$800 million for variations”, he began. “He is a strategic factor in the Total Egina FPSO Project. His closeness to Samsung officials certainly causes some discomfort. He must be the only one that still supports this variations’ drama going on. Otherwise, no other management staff supports the incredulous variations. “Yes, EPC contracts will always come with variations. Yes, it is the nature of long-term and big contracts to have variation clauses. But for the cost of variations to be running shoulder to shoulder with the contract price is carrying it too far. And the way things are going, the cost of variations may end up higher than the contract cost. Even the fabrication yard issue is laughable. I ask you: how much has Samsung invested in this whole business? Nothing! Absolutely nothing! But LADOL invested US$40.5 million in the yard. Yet, Samsung that invested nothing, a mere contractor could barricade the yard in our country and our authorities are watching”, he concluded on a sombre tone. But the Nigerian authorities are not exactly wearing a smug smile over the reported Samsung’s starchy attitude and scant regard for the Law of the land and that’s why Justice Abdulfattah Molawale Lawal of a Lagos High court ordered the Korea Company to immediately cart off the barricades and abolish the electrified fence it erected at LADOL’s fabrication and integration yard, because even if the laws appear faint or weak, especially to Samsung, they still govern business and contractual disputes in Nigeria. For Ene Haastrup, an oil and gas expert, however, the whole strife and contention that have become the ordeal of Egina FPSO point to one thing – failure of due diligence. “If the federal government and Total carried out proper due diligence”, he says, “They would have easily found out that Samsung has had a serious financial crisis since 2008. In 2017 alone, Samsung Heavy Industries earnings dropped by 35%. It lost US$499 million and still expects to end 2018 with a loss of about US$278 million”. For this Petroleum Engineer, therefore, Samsung’s single-minded quest for endless variations shows acute desperation for every dollar they can get to save their withering parent company back home. The barricading of LADOL and the electrification of the fence, for him, is a full-blown rash of extreme behaviour that no government should tolerate. “They must be addressed drastically without allowing Samsung to give a false impression to the global business community that you can’t do business with ease in Nigeria. I can tell you for free; that is part of their plan despite the incredible amount of money they’ve carted away from this country. Very sad indeed”, he lamented.